On this summit I first did a reccie to see what access was like, documented it, and then eventually went back to activate it. Summit also known as “Am Buch”. Wx foggy – visibility down to 50m in places. Access from Roßhaupten – at end is a private road – use at own risk. Track from end of tarmaced road VERY, Very muddy – not driveable and in fact hard to walk up without good hiking shoes! According to the coordinates in the SOTA DB the actual summit is within the forest, but the location of the cross (that looks down onto the forest) is certainly within 25 vertical metres of the DB point. The area at the Cross has room for antennas and supports for squid pole and a useful seating bench. Time to walk from car to summit (without equipment) – 10 minutes – allow 20 minutes with equipment. Time from home to parking spot – 1hr. 15Min. (return 1 Hr.). Good cellphone coverage – 4 bars for Telekom & Vodaphone. Internet connectivity is fine. No apparent RF noise at the time I was there (around 10:30/11 am). THIS SUMMIT WILL BE DIFFICULT TO ACTIVATE IF THERE IS SNOW COVER. While I was looking for a summit to activate that I hadn’t activated yet, I remembered that I had done a “Reccie” on Zwieselberg and while the heat wave had ceased for a few days, I decided to take a shot at this summit, early morning, to perhaps catch the end of the long path opening to VK. Karl M3FEH was also planning to be out in Cornwall on his FIRST SOTA activation, so I was hoping for an S2S with him. The equipment was all, ready and packed. The modified QAMP (now with a 12v fan added to cool the transistors) had been tested in the workshop to make sure the issue with one of the BNC connectors had been solved and that neither of the two transistors had actually failed in the last activation. The coax on the Aerial-51 404-UL OCF dipole had, had it’s PL259 plug changed to a BNC plug to reduce the number of adapters required. So everything was prepared. 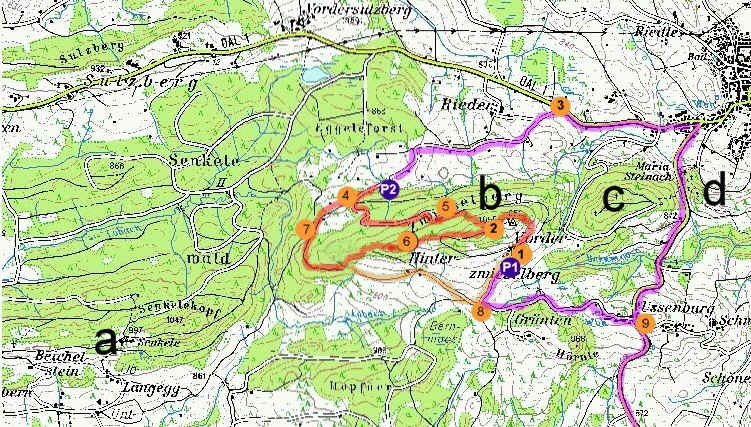 I printed out the road route from Google Maps and then went through and wrote a list of the major junctions and villages that I needed to look out for en-route to Zwieselberg. All set for an 7:30am local, departure. Everything was packed into the car and I set off in direction of Zwiselberg, already at 7:15am only to notice that the diesel in the car was nearly out, so a small diversion and delay was needed to fill the tank. Some of the route ran along nicely while on other sections I was stuck behind tractors or trucks or simply cars that thought 60 not 100 Km/h was the speed limit. In any case I arrived and parked at the same parking spot as I did for the reccie. It was about 8:30am and still cold – I was glad I had brought my light jacket. The climb with all the radio gear, food and water started and that was when I realised how steep this route is. It would definitely not have been possible without good hiking shoes and probably not at all in the snow! I forced my way on and eventually reached the summit totally out of breath but greeted with a beautiful view across the valley and the large lake (Forggensee) – a real contrast to what I could see from here the last time I was here! I quickly unpacked and installed the squid pole and antenna, then set up the rest of the equipment on the bench in front of the cross and was on-air before 9am local (0700 UTC). A quick look on SOTAWatch via RRT and a tune around found no SOTA stations, so I self spotted and called. I got a call back from Dinos SV3IEG. I then saw a spot for Karl M3FEH/p on Kitt hill and found him just finishing with Paul VK5PAS. I called him for an S2S contact and for a moment, I wasn’t sure whether it was Paul or Karl who had come back to me as the signal had increased dramatically. It was Karl and this would be the story of 20m on this activation – signals going from almost nothing to 5-9 and back again within less than a minute. After working Karl, I went back to my spotted frequency and started calling CQ again – it took some work but I managed two more contacts on 20m – an S2S with Mike 2E0YYY on Gun and then Paul VK5PAS out of South Australia. 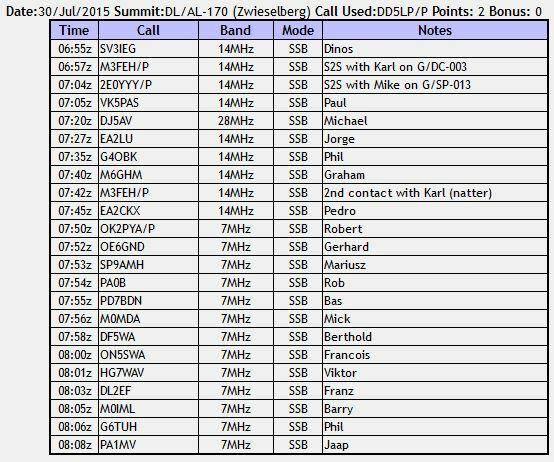 Then it went quiet, so I decided to try 10 metres – DJ5AV Michael, located on Lake Constance (not far away) came back to give me a 10m contact but that was to be the only 10m contact for the day, despite trying an arranged contact with Jorge EA2LU. His 1 KW signal was coming in probably about S4 or S5 but my puny 5W was not making the trip back. After a couple more contacts on 20m, I switched to 40m and was flooded with contacts. It seems 40m was the best band for this activation, logging 13 contacts in 16 minutes. The full log is shown below. Towards the end of the activation, I got a visit from a cyclist who hung around for a chat and to find out what I was doing. Her son and husband are both interested in technology, so she got one of the DARC introduction to Amateur Radio brochures from me and hopefully that might lead somewhere. This lady also told me that there was a less steep access path from the rear of the summit with reasonable car access to not far away. Perhaps worth checking out next year as the trip back down the track to the car was probably more precarious than the one up with loose gravel, stones and soil on a very steep track. This was an enjoyable activation, not just for the couple of SOTA points, but also for the fact that I managed to contact Karl on his first SOTA activation. It is of course always a pleasure to catch up with Mike 2E0YYY on a summit and the contact with Paul (nearly always a strong signal) from Australia, also fitted this relatively easy going day. The visit of the lady cyclist allowed me to promote the hobby and the weather stayed clear and dry to give me some wonderful views of the area. Oh and yes all the equipment worked perfectly. All in all a very enjoyable activation.